* Please Select a Length: Choose Options 24" 36" 48" 60" 72" 96" 120"
The "SOFTIE MASTER KIT™" is a multiple interconnecting test lead kit designed to access all those hard to reach areas.This concept lets you say "goodbye" to hand fatigue and finger calluses. A soft probe that bends 90 degrees or more. A probe that conforms to the shape of your hand. 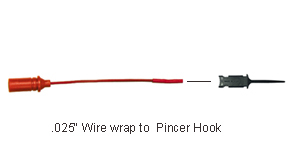 This soft flexible probe bends gently to reduce wear and breakage of the lead. Many combinations are possible with the "screw on" accessories shown above. The 18 gauge meter leads, are made of top quality silicone. Improved "shrouded right angle connector "
Best probes on the market, made in the USA and a copy of our constitution to top it off, excellent ! Very impressed with the fill and quality of your products. Got these for a Fluke and another set for another meter. Very high quality leads. Sharp gold plated tips make an incredible difference in ease and confidence in measurements. The included Pocket Constitution was a nice touch! You guys just never cease to amaze me!! When zeroing my BK Precision 114A VOM with other leads, I always have to press the leads together real hard and scratch them around to get a good connection and zero the leads. But with my new 8026SK leads, all I have to do is lay one lead on the other and the needle sits on zero so nice it looks like a photo!! Outstanding!! I have never seen any leads like Probe Master leads in my life. They just blow my Fluke and Brymen leads away! I now have Probe Master leads on my Fluke 87V and Brymen 869s also. I just can't say enough how happy I am with these leads. Probe Master leads and scope probes are all I will ever buy again for the rest of my life! Thanks guys for making such high quality leads and probes at very affordable prices!! Nice probe set with some extras that will work very well with today's electronic components that are getting smaller all the time. Leads of this quality are a huge upgrade to a multimeter. I have excellent multimeters (Fluke 8060A, Keysight U1282A) and for decades have just used the probes that came with the units. Never again. These make near zero ohm contact with zero effort. Such a pleasure to use. I never write equipment reviews but this product deserves it. 8000 SERIES - TEST LEAD MASTER KITS 8043SK 61"
Original moltimeter has sometimes disconnections in the beep . On prob master The beep is continuous I think the reason is because they are coated with gold. These leads are very good. They work very well with my Fluke 289. The accessories seem to be excellent quality. The case has a quality hinge on it that seems like it will never wear out. My only complaint is that the sprung hook attachments are not like they are in the picture. The tip of them is more like an "L" than a "J" so they are not really a "hook". This causes them to slip off sometimes. I may try and bend them into the shape they are in the picture, but I feel like they should have come that way from the manufacturer. Another minor negative is that the probes are not compatible with the probe holders built into the back of my meter. But overall, these are either the best, or equal to the best multi-meter probes I have ever used. The product is perfect, the shipping was fine and fast too. The only thing you should do better is putting the invoice on the outside of the parcel. I had to drive to the German customs and wait a lot in that office and that took me a lot of time. This wasting of time could have been avoided if you put the invoice on the OUTSIDE of the parcel. The test probes are well made, the accessories cover most use cases and the free shipping is an added incentive. I especially like the fact these probes are threaded to accept accessories. The other pair I own has push fit accessories that need pliers to remove! Only (minor) quibble is with the included hard case. It can be improved with the addition of molded foam inserts. That will keep the accessories from rattling around.